performed or occurring as a result of a sudden impulse or inclination and without premeditation or external stimulus. During our recent trip to Shanghai, we book our business flight tickets during the Spontaneous Escape in July and had saved 30% miles of the original value. Which is a definitely a steal for us! If you are still unaware of this promotion that Singapore airline has every month, it’s time to mark down the date released date of this promotion – 15th or 16th of every month. This month, the spontaneous is delayed to 19th. If you are still unaware, H & I love spontaneous escape because impromptu trips are fun! Plus, you can save up to 50% of miles use! In short, these promotions are offered at a saver rate to occupy the seats that can’t fill in December. As we all know, Singapore School holiday is in December. Thus, most of the flights are and will be fully book. I am surprise they still have this promotion going on. Anyway, if you are still unsure of where to bring your kids to during this school holiday, you might want to consider bringing them to the countries below because buying tickets during peak period can be costly. Do note that these saver seats do not include tax and is non-refundable. Tickets redeemed under this promotion cannot be cancelled or changed. 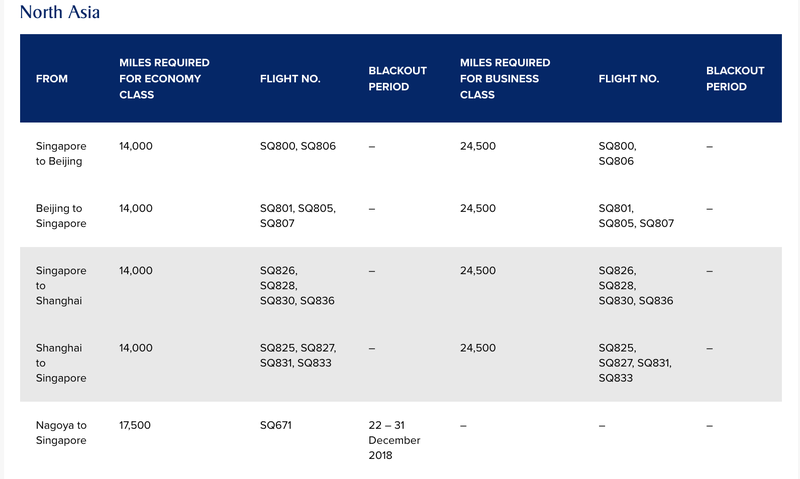 Also, if you are under waitlist for any of the flight, you will not be able to enjoy the discounted price when the promotion end (30th November). Do read the terms and condition before booking! Top value for miles is definitely to Business class flight to Shanghai or Beijing. They do not have blackout period and return flight is available for booking. Plus, it’s a 37.7% of savings compared to the flight reward. Instead of paying the usual 65000 miles one way, it’s 49000 miles return. Personally, I think it’s a pretty good deal since flight ticket in December is expensive. Beijing and Shanghai is very different. Beijing is home to historical places and there are lots of museum to visit. Thus, if you are planning to bring your kids for holiday, I would think that Beijing is definitely a better choice. On the other hand, Shanghai is a very vibrant city that you do not want to miss. From iconic skyscraper to technology, Shanghai is the place to go! However, if you have been to Shanghai many time, you can explore other areas near Shanghai. ]My personal favourite is Ningbo and it is only 2 hours away from Shanghai. 5 Day Trips from Shanghai!